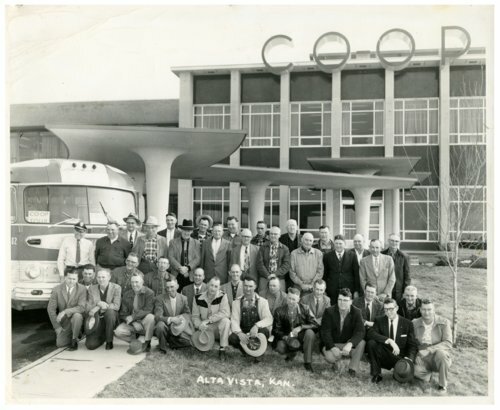 A large group of Alta Vista farmers and ranchers stop at the Co-op offices in Kansas City while on a bus tour in 1958. Identified from left to right, first row: Vernon Zeckser, Oral Weeks, Homer Roberts, Walter Kraus, Vernon Richter, Clyde Thomas, Albert Meinhardt, Theodore Jones, Victor Zimmerman, and Virgil Bryant. Second row: Aaron Unruh, Harlow Crowell, O.H.Swenson, George Eberle, Roy Carlton, Wayne Horne, Dale Fechner, Emmit Furney, and Walter Rutledge. Third row: Charles Wrenn (bus driver), Carl Ziegenhirt, Purley Horne, Bert Sisson, Arthur Kahle, T.W. Hodge, W.R. Zimmerman, Henry Andret, M.W. Andres, and Walter Swartz. Fourth row: Roy Reed, John Little, Maurice Cashman, Wallace Cripps, Dan Cashman, William Reineke, Benjaman Pape, C.E. Ensiminger, and Ed Newmeyer.